Washington Dry Cleaning Insurance. If you own and operate a dry cleaner, then you should consider insurance to protect your business. Being the owner of a dry cleaning business means that you are exposed to lots of risks. One single lawsuit can cause you to lose everything you've worked so hard to build. 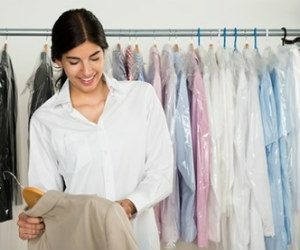 Dry cleaners use chemical applications instead of water to remove dirt, dust, and other debris from customers' clothing and other fabric items. These may include special fabrics that may be damaged by water, including leather goods and furs. Services may be provided to the general public or may be limited to commercial or institutional customers. Depending on the type of customer and services offered, the operations may include pickup of soiled material (either from customers' premises or from owned drop-off stations), sorting, spot-cleaning (pretreatment for stains), laundering or dry-cleaning, pressing, and, delivery or return of the items to the customer. Special coatings, such as stain-proofing or waterproofing, may be applied during the cleaning process. Incidental repair work, such as sewing on buttons, may also be performed. To protect yourself from the risks that come with operating this type of business, Washington dry cleaning insurance is a good choice. Let's take a look at some of the different laundry service insurance policies that you can use to protect your business. 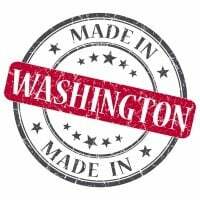 Washington dry cleaning insurance protects your laundry service from lawsuits with rates as low as $37/mo. Get a fast quote and your certificate of insurance now. Although it's important to get the best dryers and washers for your business you should also be concerned about the protection of your business. Every single day your business is faced with numerous risks. Some of these risks can cause financial damage to your business - Washington dry cleaning insurance helps. Commercial General Liability Insurance: If you need protection from customer injury or property damage then this is the insurance you must have for your business. When a customer slips and falls while using your services this is the best type of Washington dry cleaning insurance to have. When you have this type of insurance you can assist with any medical costs associated with the injury. Business Property Insurance: With this type of insurance you protect the buildings and the machines you use for the operation of your business. Equipment such as coin-operated washers, dryers, commercial laundry machines, dry cleaning machines and other equipment owned by your business will be covered by this insurance. Whether you are renting or you own a WA building to operate your business you must protect it with Washington dry cleaning insurance. Business Interruption Insurance: With business interruption insurance you protect your store when unexpected events happen that stops business operations. Any damage done to your business can cause you to lose income. This Washington dry cleaning insurance allows for the reimbursement of any income losses and any other business expenses because of damage to your business. It's a good idea also to expand you business interruption coverage to cover utility interruptions as well. Equipment Breakdown Insurance: This type of insurance provides coverage for when equipment breaks down in your business. When machinery breaks down you can lose income but when you have this insurance you can be reimbursed for the income you loss. You can never predict when something like this might happen which is why you need to be prepared by having this insurance. Workers' Compensation: Workers comp is required in most states for any non-owner employees. This insurance allows you to provide assistance to an employee if they are injured and need medical attention. If an employee gets injured and the injury leads to death then this is insurance pays benefits to the surviving family of the victim. Property exposures generally include a small office, drop off and pick up storefront, dry cleaning facilities, and perhaps a warehouse for storage. Ignition sources include electrical wiring, dry cleaning equipment, heating and air conditioning systems, and water heaters. Flammables include the textiles or other fabrics to be cleaned, scrap materials, lint from dryers, and chemicals used in dry cleaning. At one time, the chemicals used were highly flammable, but most dry cleaners now use alternative chemical applications with less exposure to fire or explosion. One chemical is generally used to pretreat stains and another to clean. The spot cleaners tend to be the most flammable. Hazards increase without proper storage and handling methods. Fire and explosion hazard may be severe unless there are dust collection systems and procedures for regular removal and disposal of scraps. Poor housekeeping is a serious fire hazard. Sprinklers may be advisable. Unless disposed of properly, greasy, oily rags (such as those used to clean the machinery) can cause a fire without a separate ignition source. Fuels, oils, and lubricants will increase the fire hazard if vehicles are stored and maintained on the premises. Equipment breakdown exposures include breakdown losses to the dust collection and ventilation systems, laundering and dry cleaning equipment, electrical control panels, and other apparatus. Breakdown and loss of use of the water heaters, dry cleaning, and pressing machinery could result in a significant loss, both direct and under time element. Crime exposure includes both employee dishonesty and theft of money and securities, particularly if there are numerous cash transactions, such as at drop-off points or collections by route drivers. Lack of control over pre-employment background screening, separation of duties, and reviews of procedures used at customers' premises increases the exposure. All retail operations should have a monitoring and verification system to reconcile bills and receipts with services rendered. Holdup potential is high, especially in retail operations. Frequent deposits should be made, especially on high volume days. Inland marine exposure includes accounts receivable if the dry cleaner offers credit, bailees customers, computers, and valuable papers and records for customers' and suppliers' information. The bailees customers' exposure starts when the property is entrusted to a dry cleaner's employee and ends when the property is returned to the customer. The primary causes of loss are fire, theft, collision, overturn, and water damage. Hazards increase in the absence of adequate procedures, such as tagging or marking, to identify each customer's goods. Premises liability exposure is very limited at the plant due to lack of public access. Any receiving areas should be in good condition and free from any tripping hazards. High concentrations of chemicals used in the cleaning process may be corrosive and/or toxic. Fumes, spills, or leaks may result in bodily injury or property damage to neighboring premises. Off-site exposures are high as drivers interact with customers in the pickup and delivery operations. Personal injury exposures include assault and invasion of privacy. Failure of the cleaning service to run background checks and review references on employees both increases the hazard and reduces available defenses. Completed operations liability exposure is low to moderate from items being damaged during the cleaning process, with the frequency being a greater concern than severity. Vapors, odors, and skin, eye, or lung irritants may result if chemicals are not properly removed from the item cleaned. Environmental impairment liability exposure is high due to the potential for air, surface or groundwater, or soil contamination from the use and application of chemicals and detergents. The soil around the premises may be contaminated by disposal of chemicals used in the past. Disposal of perchloroethylene must adhere to EPA standards. The chemical is expensive but can be reclaimed and reused. Workers compensation exposures can be high. Work may be performed under time constraints. Workers can experience lung, skin, or eye irritations and reactions to the dry cleaning chemicals, which may pose a long-term threat from cumulative exposure. Employees must be fully informed as to the potential effects of any chemicals, including long-term occupational disease hazards so that they can take action as quickly as possible. Cuts and puncture wounds can result from sewing. Slips and falls can occur during cleaning at the dry cleaning facility, or at customers' premises. Back injuries while lifting or handling materials can occur, especially for employees engaged in pickup or delivery. Repetitive motion injuries can be reduced if workstations are ergonomically designed. Pets owned by customers may attack or bite workers. Business auto exposure may be high if pickup and delivery services are provided. Deadlines placed on drivers increase the hazard. All drivers must have a valid driver's license and acceptable MVR. Vehicles must be regularly maintained and records kept at a central location. If vehicles are taken home, there should be written procedures regarding personal use by employees and their family members. When you are in the WA laundromat and dry cleaning business you face many risks. Having the right insurance for your business protects you when your business faces a lawsuit. Insurance can be the difference between losing everything in a lawsuit and keeping your business profitable. Request a freeRequest a free Washington Dry Cleaning insurance quote in Aberdeen, Anacortes, Arlington, Auburn, Bainbridge Island, Battle Ground, Bellevue, Bellingham, Bonney Lake, Bothell, Bremerton, Burien, Burlington, Camas, Centralia, Chehalis, Cheney, Clarkston, College Place, Covington, Des Moines, DuPont, East Wenatchee, Edgewood, Edmonds, Ellensburg, Enumclaw, Ephrata, Everett, Federal Way, Ferndale, Fife, Gig Harbor, Grandview, Hoquiam, Issaquah, Kelso, Kenmore, Kennewick, Kent, Kirkland, Lacey, Lake Forest Park, Lake Stevens, Lakewood, Liberty Lake, Longview, Lynden, Lynnwood, Maple Valley, Marysville, Mercer Island, Mill Creek, Monroe, Moses Lake, Mount Vernon, Mountlake Terrace, Mukilteo, Newcastle, Oak Harbor, Olympia, Othello, Pasco, Port Angeles, Port Orchard, Port Townsend, Poulsbo, Pullman, Puyallup, Redmond, Renton, Richland, Sammamish, SeaTac, Seattle, Sedro-Woolley, Selah, Shelton, Shoreline, Snohomish, Snoqualmie, Spokane Valley, Spokane, Sumner, Sunnyside, Tacoma, Toppenish, Tukwila, Tumwater, University Place, Vancouver, Walla Walla, Washougal, Wenatchee, West Richland, Woodinville, Yakima and all other cities in WA - The Evergreen State.